At last, we got down to the real nitty-gritty of our canoe hire project. Yes, we looked at canoes. ‘Escape Watersports’ in Pyle is an independent canoe store in the Village Farm Enterprise Park and is the closest canoe supplier to the Swansea Canal. So we were out in force to see what we needed. Our six strong expeditionary force which travelled down the M4 was joined by our Project Manager, Richard Preece, from SPLASH, the body who have awarded the grant which enables us to fund the project. 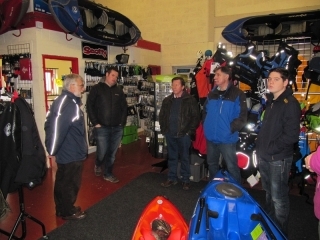 We were given some expert advice from Gus at the store and it soon became evident that we would need a majority of ‘sit on top’ individual kayaks like the Calypso Islander with a smattering of 16 or 14 foot family canoes like the Mad River ‘Journey’ or ‘Explorer’ to maximise the benefit to both our target weekday school users and the casual visitors at the weekend. Gus will price up a number of combinations of these two kind of boats for us to make a decision on purchases. It is an exciting prospect. The photo below shows Project Manager, Richard, looking thoughtful in front of a stack of Calypso Islanders (Harry Belafonte not among them).